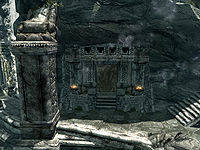 Endon's House is the home of Endon, Adara, and Kerah in Markarth. It is next door to the Treasury House, on the first terrace up, above the abandoned house. * Only becomes a fence after completing the relevant quest. The entrance is normally adept locked. The property has piles of fancy cookware throughout including bowls, plates, goblets, platters and jugs, etc. Upon entering there is a large room with a couple of shoulder-height partition walls segregating separate areas. On your right against the east wall is a set of shelves holding a gourd, a goat cheese wheel, a sheaf of wheat and a copy of Chaurus Pie: A Recipe, with a barrel containing bottles of Nord mead to the right, in the corner and a pair of fine boots on the floor beside it. Further along the wall to the left is a small square table and chair with a silver amethyst ring on top and a washbasin to the left, with a bowl on top, containing an empty lesser soul gem. There is a food barrel in front of the partition wall to the north. In the southwest corner of the room is a small raised area with a long stone table against the west wall with two display cabinets on top, they are both adept locked and contain many different silver necklaces and rings. To the left, against the south wall is a set of shelves holding an unlocked chest. To the right of the stone table is a small set of shelves with a food barrel to the right of them. In the northwestern corner is a door through into a bedroom, while in the northeastern corner is another raised section. This one has a fireplace on the east wall with a piece of silver ore in the flames. To the left is an anvil, with a workbench along the west wall. Against the back of the partition wall is a stone table with a piece of silver ore and an open crate containing four silver ingots on the table and another open crate to the left of the table, on the floor holding five pieces of silver ore. Through the door into the bedroom there is a wooden bench and stool on the left, against the west wall, with a plate of bread and cheese on top of the stool and a bowl of grilled leeks on the floor. To the right, against the south wall is a cooking pot on a stand and against the east wall is a long wooden table with a bottle of wine, a pheasant breast, a portion of grilled leeks, two salmon steaks, a cabbage, a goat cheese wedge and a cast iron pot containing a baked potato and a carrot. Under the table is a basket containing a cabbage, a gourd and two potatoes. To the north is a raised section with two small flights of stairs up to it, with a low wall between them holding a platter and gourd. In the center of the north wall is a king-sized bed coming out from the wall with an end table to the right, on top of which is a bottle of alto wine and a bunch of jazbay grapes. In the northeastern corner, along the east wall is a child's single owned bed, with a round wooden table and chair at the foot of the bed with a bunch of tundra cotton, an orange dartwing and a copy of the non-skill book version of Vernaccus and Bourlor on top. To the left of the king-sized bed is a dresser with a small coin purse, three loose septims, a flute, a blue butterfly wing and a silver sapphire necklace on top. 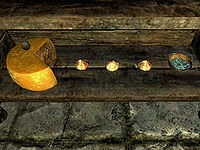 Against the west wall is a set of shelves holding a bottle of alto wine, a bottle of wine, a red apple, a couple of pieces of cheese, a slaughterfish egg, three garlic bulbs and a bowl of glow dust. In the far side of the house there are samples of garlic, glow dust, sliced goat cheese, and a slaughterfish egg which clearly resemble Pac-man. A Fence shadowmark is to the left of the entrance door. This is due to the fact that after you complete the reputation quest in Markarth, Endon becomes a fence for you and the guild. A Protected shadowmark is to the bottom left of the door because Endon is a member of the Thieves Guild. This page was last modified on 28 July 2017, at 18:40.